The subsidiary selection will only appear if you are using NetSuite OneWorld if you have multiple subsidiaries active. If you add a new subsidiary to NetSuite, just click refresh and it should appear in the dropdown list. Any admin can export but the preferred exporter will receive notifications in their inbox that the report needs to be exported. Date of last expense - This will use the date of the last expense on the report. Submitted date - The date the employee submitted the report. Expensify transactions will export reimbursable expenses as expense reports. Expense reports will post to the payables account specified in NetSuite. In some cases you may want to change this to credit a different account. Expensify transactions will export as vendor bills in NetSuite and will map to the subsidiary associated with this policy. Each report will post as a payable to the vendor associated with the employee that submitted the report. You can also set an approval level in NetSuite for the bills. Expensify transactions will export as journal entries in NetSuite and will map to the subsidiary associated with this policy. All the transactions will post to the payable account specified in the policy. 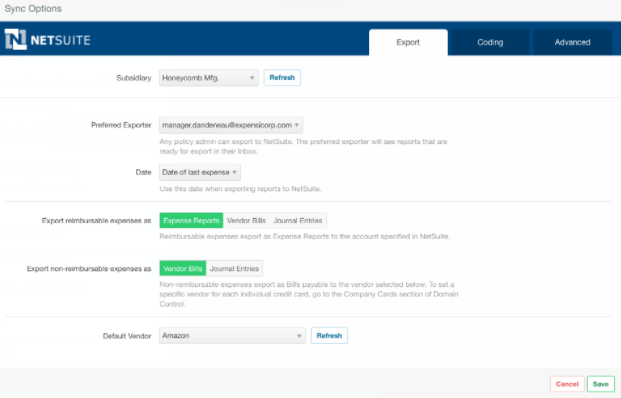 You can also set an approval level in NetSuite for the journal entries. Journal entry forms by default do not contain a customer column so it is not possible to export customers or projects with this export option. The credit line and header level classifications are pulled from the employee record. Non-reimbursable expenses will post as a vendor bill payable to the default vendor specified in your policy's connection settings. If you are centrally managing your company cards through Domain Control, you can export expenses from each individual card to a specific vendor in NetSuite (detailed instructions here). You can also set an approval level in NetSuite for the bills. Non-reimbursable expenses will post to the Journal Entries posting account selected in your policy's connection settings. If you are centrally managing your company cards through Domain Control, you can export expenses from each individual card to a specific account in NetSuite (detailed instructions here). The entire list of vendors will be available in the dropdown when selecting the option to export non-reimbursable expenses as vendor bills.